The idea of a permanent northern branch had been a long-term ambition for the Trustees of the IWM, but the trials and tribulations of putting in place the necessary funding was to be a seemingly insurmountable hurdle. 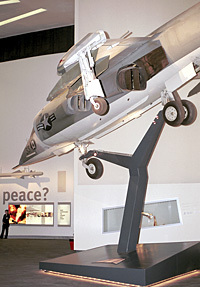 Phase One of the project eventually got underway in 1997 and was successful in raising over £30 million for the Museums develop- ment and construction. The 5 acre site on Trafford Wharf Road was selected from a list of 71 sites which had been submitted by 36 local authorities based in the North of England. The Museum is at the heart of the redeveloped Salford Quays and Trafford Park cultural areas. Trafford Park has been a site of national and international importance since the early twentieth century, when it began to develop into the largest engineering centre in the world. 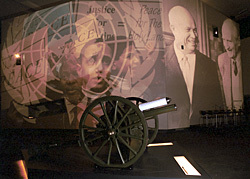 With funding now in place the project was formally launched on 25 January 1999, with construction work commencing in January the following year, with the aim of opening the Museum to the public in advance of the XVII Commonwealth Games being held in Manchester from July 25 to August 4, 2002. Peel Holdings provided £12.5 million of the £30 million needed for the project, with the remainder coming from the European Regional Development Fund, English Partnerships/North West Development Agency and Trafford Metropolitan Borough Council and the IWM itself, as well as benefactors and sponsors. Phase Two of the project was to be no less daunting. The IWM North Appeal was launched to fund the fitting out of the building, together with the implementation of the exhibition and display strategy. The BBCs Chief Television News Correspondent and famed war correspondent, Kate Adie, Chaired the Appeal, with the aim of meeting the target of approximately £2.5 million. 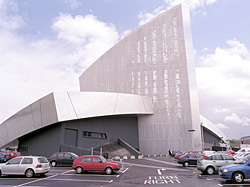 At long last the dream became a reality when The Imperial War Museum North opened to the public on 5 July 2002. THE BUILDING From the outside this landmark building is spectacular: the curvature of the glittering aluminium cladding symbolically broken by the central Air Shard as it reaches for the sky. Designed by internationally acclaimed architect, Daniel Libeskind, the building has been created to signify the world torn apart by conflict: a fragmented globe reassembled in three interlocking shards or pieces, representing conflict on land, in the air and on the water. Visitors enter through the Air Shard, which is 55m high and open to the elements. A lift takes you to a viewing platform at 29m at the top of the Air Shard, which affords spectacular views over Salford Quays towards the Manchester skyline. Immediately below,The Lowry sits on the opposite bank of the Manchester Ship Canal, reached by a stylish footbridge. The Earth Shard, with its huge curved ceilings and floors, houses the Main Exhibition Space (2,200 sq.m.) which features the long-term displays. Also located here is the Special Exhibitions Gallery (500 sq.m.) designed for showing smaller exhibitions with changing themes. The Water Shard accommodates the 160-seat restaurant with views overlooking Salford Quays and The Lowry. WHY IWM?The Imperial War Museum was established by an Act of Parliament in 1920. Its purpose is to collect, preserve and display material and information connected with military operations in which Britain or the Commonwealth have been involved since August 1914. Dedicated to war and conflict throughout the 20th and 21st centuries, the newly opened IWM North contains hundreds of objects ranging from a small number of large exhibits to works of art, photographs, uniforms, diaries, letters and medals. The Museum sets out to tell the story of how war has shaped peoples lives from 1900 to the present day, making us think about our past, our present and our future. With the story still unfolding, the Museum will continue to develop and change over the coming years. THE BIG PICTURE The IWM Norths light and airy reception and shop frontage is in marked contrast to its windowless dark inner core. Within the main area you will find The Big Picture Show, the first on this scale in the UK. Using a technique designed specifically for the building, the huge exhibition space is transformed into a wrap-around experience of pictures and sound. Billed as the main highlight of your visit, The Big Picture is a large-scale 360 degree audio-visual experience that you can walk through. It uses over 60 projectors throwing images onto 20 screens, some of them over 5 metres high and has a powerful soundtrack of personal stories. There are presently three different shows running: Why War?, Weapons of War, and Children and War. Each show lasts 15 minutes and one is featured at hourly intervals. The Big Picture was developed as a way of enabling visitors to make direct contact with some of the thousands of images, stories and sounds from the Museums collections. Even so, with over six million photographs and 120 million feet of cine film in store, the picture shows only scratch the surface. SILOS, TIME LINES & STACKS Also to be found in the Main Exhibition Space are six self-contained display areas, or Silos. Each with a different look at war and conflict, covering themes such as Women & War; Empire, Commonwealth & War, and Science, Technology & War. Next is the Time Line which runs around the perimeter walls providing the backbone of the displays from 1900 to the present day. The Time Line concentrates on personal stories and takes visitors on a 3-D journey through time. The Time Stacks, which make selected historical artefacts available for handling, are mechanical storage retrieval systems containing more than 50 themed trays of objects from the Museums collections. LARGE OBJECTS The few large objects which form part of IWM North are located in the main exhibition area. And this is where many IWM visitors have expressed a sense of disappointment, given the noticeable lack of large exhibits. In its defence the Museum maintains that it is essential to retain the unobstructed floor space to encourage visitors to walk around the darkened auditorium during The Big Picture Shows. Whilst understanding the Museums predicament in keeping obstacles to a minimum, it seems that too much emphasis has been placed on the flashing picture shows, which are impressive, but totally dominate the Museum to the detriment of many other potential exhibits - and the IWM reserve stores contain massive collections of military hardware hidden away from public view. Of the five items on show, the Royal Horse Artillery 13-Pounder Field Gun which fired the first shell from the British side in the First World War, takes central position. A Dennis Fire Fighting Trailer Pump is also on display. Widely used in W.W.II, the pumps could be easily manhandled around piles of rubble and deep bomb craters. This particular pump was supplied by the Home Office to the Ferranti Factory at Hollinwood, Oldham in 1941. The British-designed, U.S. Marines AV-8A Harrier jump-jet is an example of the worlds first short take-off and landing aircraft. Another first is a T-34/85 Tank which the Soviets developed during W.W.II. Entering service in July 1940, it revolutionised tank design worldwide. Whereas a Trabant Estate car from 1982 is indicative of the life of an East German resident during the era of the Cold War. OVERVIEW It has been a long time coming and now that the doors are open, what is the verdict? Well, for starters, your granny and granddad will be able to go back to their youth and enjoy themselves all day long in this, an Aladdins treasure cave, with its many small boxes and cabinet window displays - though I wager granny could not get into some of the wartime uniforms on display! What did concern a number of visitors on a press preview day, including many from overseas, was the bias and political spin to be found in certain areas. The Big Picture Show could be suggestive of subliminal psychology designed to brainwash the unwary. One group of exhibition organisers will place their stamp on any given subject, which could be totally different to another group's way of viewing events. And after all war is often a result of a clash of political wills and cultures. So questions were asked by members of the international press as to why there were no flashing pictures of other dictators and alleged war criminals? Why is not Bush and Blair, Bomber Harris, Sharon and others pictured alongside Milosovich and Saddam? Is the Irish Question as depicted in the Time Line racist? Why are there no pictures of refugee camps, a legacy of British involvement in Palestine? Is war all one-sided? As the commentary in The Big Picture Show stated, one-man's terrorist is another man's freedom fighter. The only way is to form your own opinion. Visit the Museum with an open mind and question and judge for yourself. The Museum is open daily from 1000 to 1800 hrs. and admission is Free. For more information see the IWM web site at www.iwm.org.uk.